Jean, Helen and Christine would like to thank all members and parents who donated items for our Bottle Stall at the Open Day on Sun 9 May. We would also like to thank those of you who came along on the day and bought raffle tickets - we raised just under £400. This money will go towards the cost of the events for this year, although we will be doing more fundraising events at a later date. It was also nice to see some of our members who are slightly more travelled than others - in particular Luke from South Shields and Lachlan and Campbell from Victoria, Australia! Hope to see you back at East End soon! Well, it’s the start of the Easter holidays and no doubt you will all be looking forward to receiving an Easter egg or two tomorrow. Let’s hope the Easter bunny brings us some luck today! Are you all looking forward to your Easter holidays? Only a couple of days before they start. 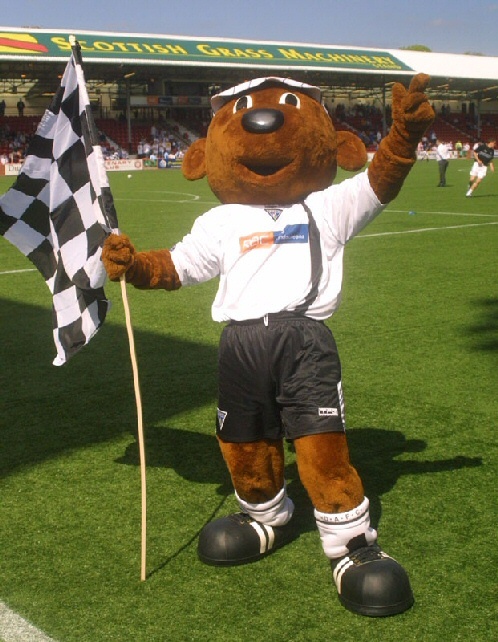 Pars in the Community are offering loads of football fun for primary school children at Dunfermline Academy of Sport at Pitreavie during the holidays. Young Par member, Luke Stewart, travelled up from South Shields for the Ayr United game as a treat for his 7th birthday. His dad and granddad went to the game with Luke. His dad was a member of the Junior Supporters Club in the 1980s before it became the Young Pars, so it’s good to see Luke carrying on the tradition in his family! Looking forward to a great atmosphere here today! Although this match is being shown on TV there is nothing to beat coming along to a live game and supporting your team! What a disappointment last weekend when the game against Raith Rovers had to be postponed because of the weather. A Happy New Year to all Young Pars members and their families! Hope 2010 is good to you all. � A Happy New Year also to the manager, players and everyone connected to the Club from everyone at the Young Pars. A warm welcome to everyone who has taken advantage of the kids for a quid offer today. Hope you all enjoy the game. It’s certainly more fun coming along to East End Park to watch the football than helping out with last minute shopping! A good turnout of members attended Bowlplex on Tuesday 15 December for the Christmas bowling night. Five players came along to captain the teams, Greg Ross, Greg Paterson, Graeme Holmes, Steven Bell and David Graham. Only thirteen more sleeps until Christmas! Don’t know about you but we are all getting excited! Hope you’ve remembered to tell Santa about all the Pars goodies that are available from the Club Shop. Christmas events have been arranged for members as follows:- Sammy`s Christmas Party for members up to 6 yrs will be held in the Kingdom Suite at East End Park on Sunday 13 December from 1.00 to 2.30pm. A Bowling evening will be held at Bowlplex for members aged 7yrs and over on Tuesday,15 December at 7.00pm. Members are advised to be there for 6.45pm in order to change shoes and be organised into teams. Players will once again captain the teams. Cost for this is £2. Phone Christine to book your place for these events. Did you all enjoy your Hallowe’en and Bonfire night celebrations? We thought the fireworks in the Glen were fantastic! We’d like to extend a warm welcome to the Junior Dees who are at the game today as part of our exchange agreement with Dundee Football Club. Hope you all enjoyed your holidays and are now looking forward to going back to school on Monday. Did you know it’s only 8 weeks to go before the Christmas holidays! Seems to come round quicker every year! Seems ages since we had a game here at East End Park! We haven’t been very successful on the road in the last couple of league games so let’s hope we get back on track here today! We’d like to remind all Young Pars that we are taking a bus to the game against Dundee at Dens Park on Saturday 12th September. The trip will be dependent on interest shown so you must phone Christine as soon as possible if you wish to go! Hope you’ve all settled back into school after what was a pretty wet summer holiday if you stayed in Scotland! We’re sure you didn’t let that put you off enjoying yourselves though! Looking forward to the first league game of what we all hope will be a very successful and exciting season! More results like last weekend would be great!